Another violinist who came from Romania became as famous as a composer as he was as a violinst. Upon his death, his home town was named after him. Can You Guess who this violinist/composer was? 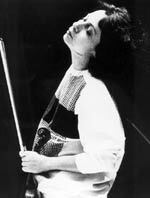 January 30, 1952 Rumanian violinist Silvia Marcovici was born. Silvia studied in Bacau and Bucharest with Stefan Gheorghiu. She made her debut at the age of 10, unanimously hailed by the critics in her country. At the age of 16 she made her international debut in Haye under the baton of Bruno Maderna, with Tchaikovsky´s concerto. George Enescu. Did you see the color clues? 1774 - Death of Bohemian composer and violist Frantisek Tuma in Vienna. 1942 - Premiere of Aaron Copland's Orchestral Suite Billy the Kid ballet suite, by the Boston Symphony. 1948 - Premiere of Harold Shapero's Symphony for Classical Orchestra by the Boston Symphony conducted by Leonard Bernstein. 1961 - Where The Boys Are, by Connie Francis, was released. 1961 - Spanish Harlem, by Ben E. King, was released. 1965 - My Girl, by the Temptations, was released. Sheet music of Kreisler's music avialable HERE. In 1969 Silvia took part in the Marguerite Long-Jacques Thibaud Competition in Paris. She still remembers the competition vividly. "We do amazing things with our youthful strength and enthusiasm. At the Marguerite Long–Jacques Thibaud Competition I was 17 and so scared they had to push me onto the stage to perform. It's actually written in the annals of the competition!" She won first prize. In 1970 Silvia went on to win the George Enescu Competition in Bucharest. Since then, Silvia Marcovici has performed with many orchestras in Europe and the U.S.A.: The Philharmonia, Royal Philharmonic Orchestra, Royal Concertgebouw Orchestra, L'Orchestre National de France, Orchestra Sinfonica de L'Accademia Nazionale de Santa Cecilia, New York Philharmonic, Los Angeles Philharmonic, Chicago Symphony, Cincinnati, Atlanta, National Symphony (Washington D.C.), Philadelphia Orchestra, etc. She has also worked with numerous conductors such as Claudio Abbado, Sergiu Comissiona, James DePreist, Placido Domingo, Bernard Haitink, Eliahu Inbal, Neeme Järvi, Jesus Lopez-Cobos, Zubin Mehta, Riccardo Muti, André Previn, Mstislav Rostropovich, Alessandro Siciliani, David Zinman, etc. She appears regularly in North America, South America, Japan, Israel and throughout Europe. She has recorded the ten Beethoven sonatas for violin and piano as well as the Sibelius Violin Concerto with the Göteborg Symphony Orchestra under Neeme Järvi. Silvia Marcovici plays a P. Albani violin made in the late 1790's or early 1800's. See her video at the bottom of this page. Silvia Marcovici is married to the violinist Diego Pagin. They live in Strasbourg and have two children. She frequently performs with her son, pianist Aimo Pagin. In 1972, Silvia was invited by Leopold Stokowski to perform the Glazunov concerto with the London Symphony Orchestra at the Royal Festival Hall. This concert was recorded by Decca. Wouldn't a Kindle make a Fabulous Valentine's Day Gift? Ask Anyone Who Owns One!